Welcome to five days of Valentine Sensory Play! You can use these resources to give your children a fun week of Valentine-themed activities packed with hands-on, creative play. Our Five Days of Valentine Sensory Play begins on 10th February 2019. 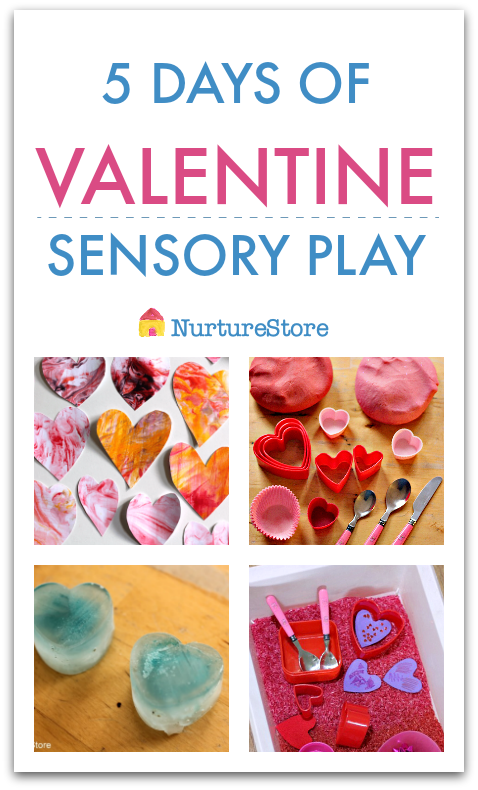 I’ll be sharing a week plan of wonderful valentine sensory play ideas along with free printables. NurtureStore hosts regular themed weeks of hands-on, creative play, giving your ideas, activities and printables all year round. Pop your email address in the box below to join the Nurturestore community and I’ll share all the resources and freebies with you! The whole world is sensory. We learn about our environment, or likes and dislikes, and ourselves by exploring using our five senses. When we offer children sensory invitations to play we are encouraging them to engage with the world, to be curious, inquisitive, bold, creative, and versatile. We’re giving them the benefit of hands-on learning, encouraging them to use their whole brain and body for richer, broader, deeper learning. Sensory invitations to play are so adaptable. They’re open-ended for creative play and linked to structured academic learning. They’re perfect for a group of children as each child can engage with the activity as is appropriate for them, depending on their age and abilities. As you offer your children these Valentine sensory play activities, sit nearby and observe how each child interacts. Listen to the language they use, the ideas they explore, the way they choose to play. It’s a wonderful insight into our amazing, unique children. Join in! We’re starting on February 10th and I’ll be emailing out details and play ideas all through the Valentine week. You might like to pick one of these ideas to enjoy around Valentine’s Day on February 14th, or offer all five over the course of your week. It’s such an advantage to give children a range of sensory play and to work on a theme. A themed-week lets children make connections between on idea and another, one material and another, one experience and another. With a range of linked activities, children are able to compare and contrast, see how things are the same and what’s different – young scientists and creatives in the making. Coming back to a theme over consecutive days gives time and space for ideas to brew, and the repetition helps children find depth and meaning . Get ready to share your play! If you would like to share your play and connect with all the other parents and educators who make up the NurtureStore community, pop a photo of your play session on Instagram and use the hashtag #ideasfromnurturestore. If you tag me too (@cathynuturestore) I’d love to come and see how you play. 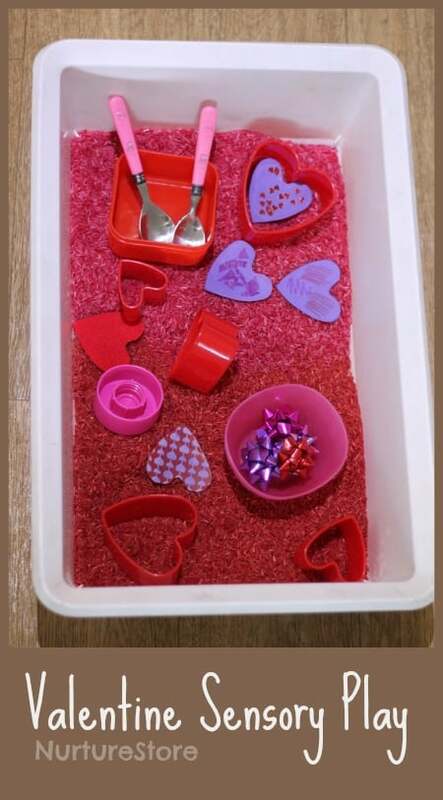 For our first day of Valentine sensory play let’s start with a sensory tub. If you’ve never made a sensory tub before it’s really easy – and such a versatile invitation to play. Get a tub of some kind: a box, a big bowl, a plastic container. You can even turn a paddling pool or sand or water tray into a huge sensory tub. Fill your tub with a base material. The choice is yours but it needs to be something that’s safe for your children to play with: water, sand, ice, ripped-up paper, rice, pasta… You might like to add a drop of pink food colouring to your water or ice to make it Valentine-coloured, and you can also dye your rice or dye your pasta. Add some extras: by adding extra loose parts to your sensory tub you’re upping the play possibilities and bringing more texture and interest to the sensory play. Again, anything goes as long as it is safe for your children to play with. You might add spoons and bowls, funnels and a colander, shells, cookie cutters, or my printable heart alphabet cards. Then invite your children to come and play! 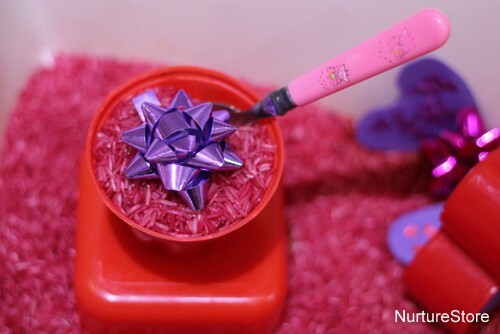 I would love to see how you set up your Valentine sensory tub and hear how your children interact with it. Share a photo with our community on Instagram using #ideasfromnurturestore so we can all visit. 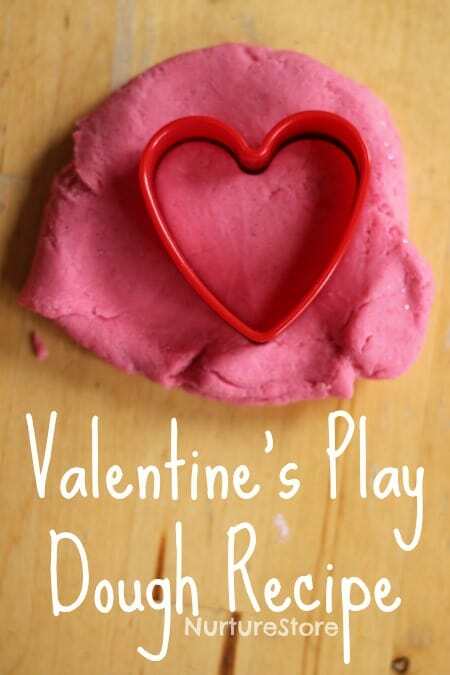 On day two of our Valentine sensory play week let’s explore play dough. Play dough is one of the very favourite play materials in our house. It’s so versatile, great for developing fine motor skills, and such a spark for creative play. You can use store-bought play dough or make your own. This is my favourite easy peasy, no-cook play dough recipe. You can add pink or red food colouring to fit our Valentine theme, and perhaps a drop of almond or rose food essence for fragrance. Set out your play dough with some kitchen items such as rolling pins, spoons, cookie cutters and cake cases. If you have a chocolate box to add in, wonderful! Then it’s over to the children to see what they can make. If you’d like to share their creations with us, please post a photo on Instagram and use #idesfromnurturetore. 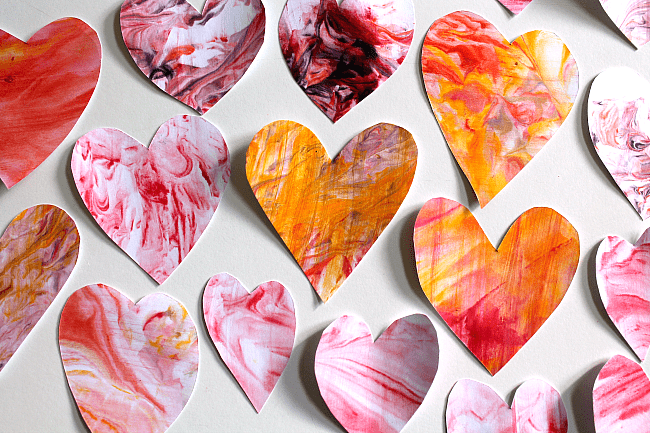 On day three of our Valentine sensory week, let’s try a combination of sensory art and science: marbling. Marbling is an exciting art technique, that’s very easy to do and produces prints all with their unique design. I’ve got a step-by-step guide on how to marble here, but the basics are to use food colouring on top of shaving foam to create colourful patterns. You press a piece of card down onto the shaving foam, peel back, and reveal your marbling print. Have lots of card ready because once our children try it once they’re going to want to make more and more! To fit with our Valentine theme you might like to cut out your prints into heart shapes. You could hand them out to people you love, or stick them up all over a door or wall. Click here if you’d like to see how to make them into a beautiful heart mobile. On day four of our Valentine week, let’s explore ice and see if we can melt someone’s heart! If you have a heart-shaped ice cube tray – perfect. If not, you can use any ice cube tray or small plastic container. Fill them with water, and perhaps a drop of red or pink food colouring, and pop them in the freezer until they’re solid. If it’s cold enough you could leave the trays outdoors and show your childen how nature does the freezing. When you’re ready to play, bring out the frozen ice blocks and explore how you can get them to melt. You might offer bowls of warm water with spoons or pipettes. For a real wow-factor offer salt – coloured pink or red if you want to go all out on the Valentine colours. (Here’s how to make coloured salt.) 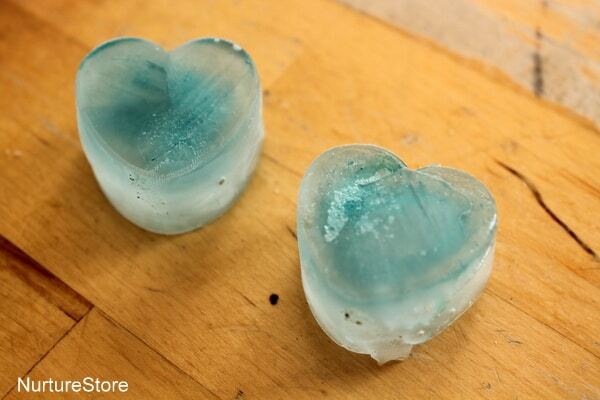 Salt-melted ice blocks look amazing! Listen in while your children are playing and you might hear them invent stories about the melted ice, or they might theories about why it melt. This sensory play is a wonderful opportunity to think like a scientist or storyteller. Let’s wrap up our wonderful week of Valentine sensory play with some beautiful heart art. The combination of wax crayons or oil pastels and watercolour paints is magical! If you’ve tried it before you’ll know the wax/oil resists the watercolour paint, making anything you’ve drawn pop out. Children love it because it looks like the writing or drawing is appearing by magic. For Valentine’s week, you might like to try a loveheart design. 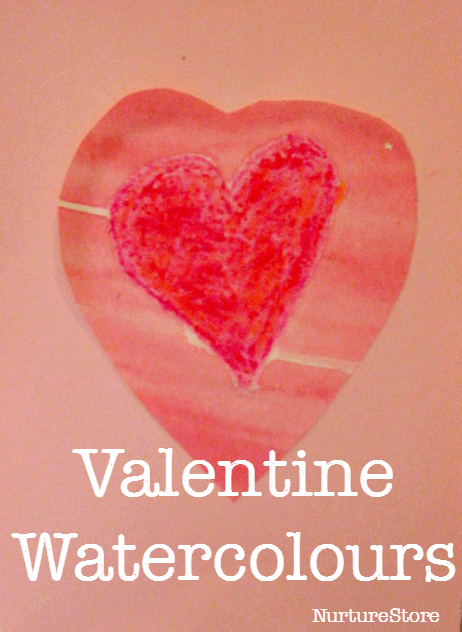 Use wax crayons or oil pastels to draw hearts allover a piece of paper (watercolour paper or card is great if you have it as it will take the paint well). Then brush over with watercolour paint, using a paint brush (a wide flat one is best, if you have it). Even very young children can join in with this sensory art adventure. You might draw the hearts for them to paint over. They could draw a scribble on a heart-shaped piece of card which they could then paint over. Older children can create detailed patterns, zentangles and mandala designs with the wax crayons and oil pastels before painting over. Experiment with the colours of crayons/pastels and paints you use and see which combinations you like. You might like to turn your finished designs into Valentine cards. Share your creations with us on Instagram using #ideasfromnurturestore. We would love to see your sensory art! Thank you for joining in with our Five Days of Valentine Sensory Play. Thank you for giving your children the wonderful experience of sensory play and the richness of exploring a themed week. And thank you for sharing your photos with us and being part of the NurtureStore community. Coming up in March: mark your planners for the week March 9th 2019….it’s going to be Rainbow Week! I’ll have some colourful ideas to share with you. If you’re not already a NurtureStore subscriber, add your email address to the box below so you receive all the details, ideas and freebies. Enter your email address to get all the resources and free printables! At our school we used almost all of these when celebrating valentines day on 14th. The children and the teachers were very excited. Thanks fantastic Rosmina. So glad you all had fun. Hope you’ll join in again with Five Days of Rainbow Play in March.